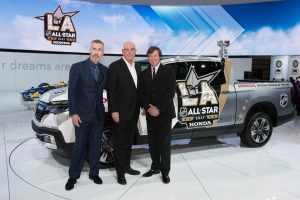 With automakers from across the globe vying for attention at the 2016 LA Auto Show, Honda once again was able to capture the spotlight with two big reveals, the first being the unveiling of the Honda Civic Si Prototype and being named the title sponsor of the 2017 NHL All-Star Game. Making its global debut, the Civic Si Prototype gave Honda fans a clearer vision of the 2017 Civic Si Coupe and Sedan, in terms of performance and design. The auto show marked the first time all five Civic variants were on display, including the Civic Type-R prototype, which had a previously never before seen interior. The Si prototype features a full Factory Performance (HFP) aero kit in addition to front and rear splitters, and sports a rear spoiler. Under the hood, a high performance, high torque direct injected, 4-cylinder engine powers both variants of the Si prototype, and includes dual variable cam timing attached to a short-shifting 6-speed manual transmission. A new active steering system, available high-performance tires, and a limited-slip differential round out some of the additional performance upgrades for the new models. On the inside, the Si prototype features exclusive front sport seats with red stitching, including stitched Si logos. This stitching emanates throughout the vehicle, making appearances on the steering wheel, doors, and leather shift boot. Drivers will also be treated to a red TFT meter, audio system illumination, and aluminum sport pedals, which seems to align right with Honda’s plan for the new Civic lineup. 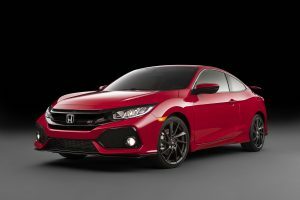 Both the Si Coupe and Sedan will launch next year alongside the rest of the 10th generation Civics, with the track-ready Civic Type-R rounding out the lineup afterward. 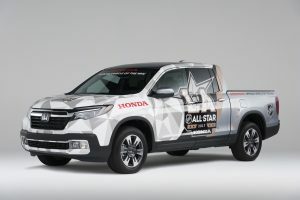 The second announcement by Honda detailed their involvement with the NHL All-Star Game, particularly their role as title sponsor for the event. NHL Hall of Famer Wayne Gretzky showed off a custom-wrapped 2017 Honda NHL All-Star Ridgeline at the auto show in concordance with the announcement, as the most valuable player of the game will receive a new 2017 Ridgeline as a part of the award. Jeff Conrad, Honda’s Senior Vice President and General Manager, discussed what this opportunity means to the company. In addition to awarding the new Ridgeline to the MVP, Honda will host the Honda NHL Breakaway Challenge, a skills competition featuring some of the NHL All-Stars at the event in which the winner will be determined by a fan vote. Gretzky, who currently serves as the official Centennial Ambassador of the NHL, expressed his excitement at not only the nature of the event but at Honda’s involvement. Honda is currently celebrating their ninth year as the Official Vehicle of the National Hockey League. For more information, visit NHL.com or follow the official hashtag #NHLAllStar on Twitter and Facebook. Error - Error validating access token: Session has expired on Tuesday, 06-Feb-18 09:00:00 PST. The current time is Friday, 19-Apr-19 17:27:33 PDT.